How can I check on what my students are learning and where they might need help? Prof. Janet Rankin of MIT explains how to use a simple, low-barrier technique to get student input on possible areas of confusion. How can I engage more students in discussion in a large class? Prof. Janet Rankin of MIT explains a technique to engage all students in discussion and discusses its benefits and limitations. 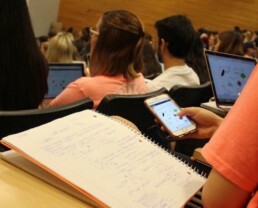 How can I individualize learning when I'm teaching a large class? Prof. Mark Andersland of the University of Iowa explains how he redesigned his large lecture engineering course to include active learning, frequent checks during learning, and immediate feedback to increase student engagement and learning. How can I know what students are learning while they are learning so I can provide immediate feedback? Prof. Steven Hall of MIT explains and demonstrates how to gain information about what his students are learning and give them feedback for immediate use. Note: ScreeenFlow ONLY RUNS ON MAC. If you are a PC user, you will have to use a different application for screencapturing and video editing. ScreenFlow is an easy application to use for both screencapturing and video editing. For anyone that misses iMovie HD from the late 2000s, ScreenFlow is the salve for that itch for a simple, great editing platform. For those of you Mac users who have never used an editing application of any kind (and the current version of iMovie doesn't do it for you—does it for anyone?) ScreenFlow would be a great introduction for you. Download a trial of ScreenFlow. OR Contact us to schedule some time in the FIC Catalyst Lab for a hands-on trial there. How do you motivate students in an asynchronous online course? Ben Bays, an instructor in the Department of Radio, Television, and Film talks about engaging students and motivating to go above and beyond standard course requirements through the use of online badging application. In Ben's case, he's using a application called Badgr. Badgr integrates seamlessly with Canvas and is easy to set up. There are both free and paid PRO versions. Learn more about Badgr here. Learn how to activate Badgr in your Canvas course here. Clipular is a plugin for the Chrome Web Browser. This makes it platform agnostic (Windows, Apple, or Linux). Want to install the plugin in your Chrome Browser? Go here to get the plugin. 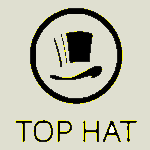 *Student pricing can be reduced to free with instructor subscription to other Top Hat services. Check out and/or a view a copy of the CRS Review Final Report. Zoom is a FREE video conferencing tool that allows you to host and record virtual meetings, conferences, break-out groups, office hours, and more. As with any application, Zoom offers a paid version that have more features as well. Zoom also offers free apps that one can download to their phone or laptop so that they can be a participant in a meeting. Want to try Zoom? Check out their website. How can you and your students know what they are learning in the moment rather than at the end of a semester? Dr. K. Sata Sathasivan explains how he uses a classroom response system (Squarecap) to provide almost instant feedback on what students are learning.